Heat oven to 350°F. Line 12 mini and 12 regular-size muffin cups with paper baking cups. In large bowl, using whisk, mix flour, granulated sugar, 1/2 cup cocoa, the baking soda and salt. In medium bowl, using whisk, mix soymilk, canola oil, vinegar and 1 1/2 teaspoons vanilla. Pour wet mixture into dry mixture; beat with whisk until well mixed. Stir in chocolate chips. Fill each mini muffin cup with 1 level measuring tablespoon batter. Divide remaining batter among regular-size muffin cups. Bake mini cupcakes 12 to 16 minutes or until toothpick inserted in center comes out clean. Bake regular-size cupcakes 22 to 26 minutes or until toothpick inserted in center comes out clean. Cool in pans 10 minutes; remove from pans to cooling rack. Cool completely, about 30 minutes. For frosting, in large bowl, beat margarine, coconut oil, 1 teaspoon vanilla and 2 teaspoons of the water with electric mixer on low speed until smooth. Beat in 3 tablespoons cocoa and the powdered sugar, 1 cup at a time. Gradually beat in just enough remaining water until smooth and spreadable. 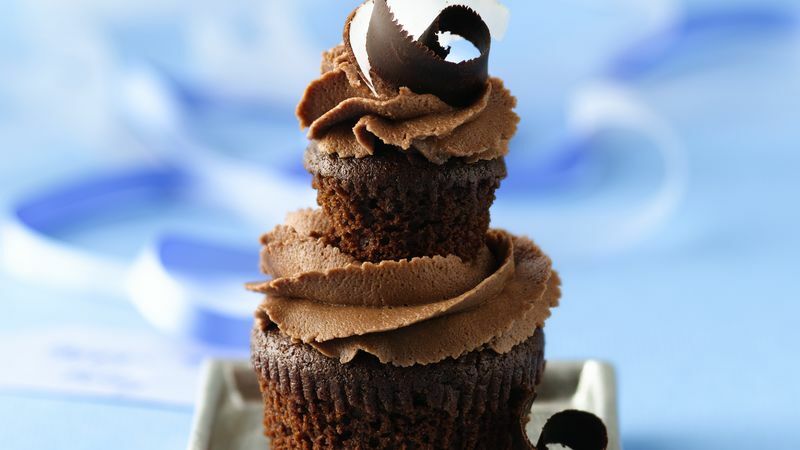 To assemble cupcake stacks, remove paper baking cups. Pipe frosting on top of 1 regular-size cupcake. Top with 1 mini cupcake; frost top of mini cupcake. Repeat with remaining cupcakes and frosting. Garnish with chocolate curls and coconut, if desired. Cooking Vegan Always read labels to make sure each recipe ingredient is vegan. If unsure about any ingredient or product, check with the manufacturer. Sugar granule size can differ among manufacturers. Be sure to use a fine crystal granulated sugar for the cupcakes; coarse crystal sugars do not dissolve as easily during baking.